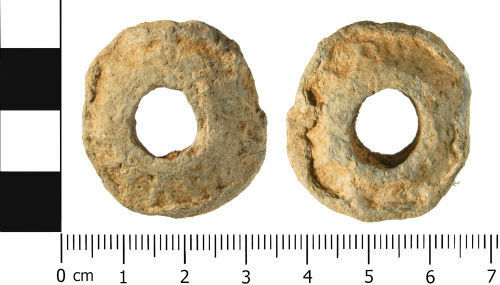 A complete cast lead or lead alloy bi-convex decorated spindle whorl, of Roman to Post Medieval dating (1 - 1650 AD). The spindle whorl is sub circular in plan, and lentoid in cross section. Both the upper and lower faces have a cast rim along the edge (approx 4.5mm thick), with a similar rim around the inner edge. both the upper and lower faces have been decorated with alternating diagonal ribs. The central hole is circular in shape and has been cast / set slightly off centre. The whorl measures 31.4mm in length, 28.87mm wide and is 10.96mm thick. It weighs 41.5 grams. The whorl is of a light to mid grey colour, with signs of abrasion damaging the patina. Spindle whorls, as an artefact type, can be hard to date accurately as they remained in use for a long period of time, however lead alloy spindle whorls of this type are normally attributed to the Medieval period (c. 1100 to 1450 AD). The weight of the spindle whorl is suggestive of a thick linen or wool fibre being spun, as there is a direct relationship between the weight of the whorl and the thickness of the resulting thread. Fine threads such as silk require a lighter whorl than those used to spun wool or linen.